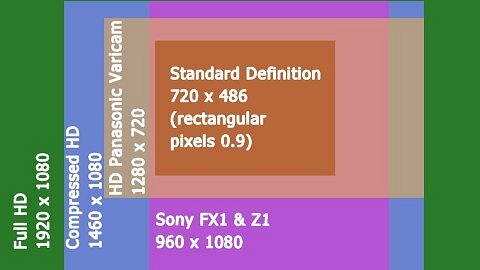 Various HD resolutions with the standard definition TV (SD) in the middle. Starting resolution of the original video content from HD down to DV. The higher up on the chart below equals higher quality picture and pixel resolution. The Black to Gray to White part of the image - The eye is much more sensitive to luminosity or the black, gray and white portion of the image. This is designated by Y and called Luma for short. Luma is always kept as high as possible with video cameras. Color part of the image: The color part of the image is in the R-Y and B-Y for analog type cameras and called Cr and Cb for digital type video cameras. Older terms often used for color part of the image: To make it more confusing, the color space is sometimes referred to as U Chrominance for R-Y and V Chrominance for B-Y. U and V are carry overs from the European PAL TV standard and older systems. R-Y and B-Y and Cr and Cb are the correct terms. 4:4:4:, 4:2:2, etc. : Numbers are used as a shorthand to describe the relationship between Luma and the color part of the image. 4:4:4 is full bandwidth for all parts of the image.You can get this from film to digital transfers and with some very high end, expensive HD cameras. 4:2:0 is MPEG-2 which is DVD. There are other combinations and special image processing with some cameras. Just like horsepower is not the only way to describe how a car works, these numbers are not the complete story of how the image looks. Film, on the other hand is not divided up into Luma and color part of the image. The sharpness and color quality is dependent on the type of film. Daylight shots with high-quality film needs 4K of resolution, which is 4096 x 3072 pixels and night shots need half of that.The actual top end of film can go beyond 4K, but it is ascertained that an average audience member, sitting an average distance from the film, cannot make out resolution greater than 4K in daylight scenes. When film is transfered into the digital domain, it is done with the highest resolution possible for both Luma and color. 4K resolution is usually only used when working with digital special effects. The present highest quality HD camera can only capture about 94% of a 2K film transfer. This capture rate was used in the filming of the last 3 episodes of Star Wars. i=interlaced frames, p=progressive and non-interlaced frames. 35 mm night (2k used for telecine) progressive frames. Super 16 mm (2k used for telecine) progressive frames.